Showing 51 articles from February 4, 2015. LOUISBURG -- Franklin County commissioners agreed to settle a dispute with the former airport operator -- agreeing to write a $1.5 million check to the corporation. Knightdale Airport Inc. and Carlina Inc. filed a lawsuit in the fall of 2013, alleging that Franklin County breached a 40-year contract that cost them millions in investments and future earnings at the airport. Schools get good grades locally; what will state's scores indicate? Even as they braced for the release of A-F performance grades for North Carolina's public schools, local educators released results from their own, in-district web-based survey that shows very good "grades" for local schools. The state report card was to be released after the deadline for this edition of The Franklin Times passed, but school districts across the state are bracing for the worst while some, like Franklin, tried to make a sort of preemptive release of local grades in counterpoint to what are expected to be dismal results on the statewide grades. FINDERS KEEPERS? That wasn't the case for a couple of Terrell Lane Middle School students recently who did the right thing after finding a bit of treasure after school. Diana Potter, left, and Kristen House, pictured with Principal Kent Lovett, discovered $1,139 in cash in the Terrell Lane parking lot just after school was released last Wednesday afternoon. The dynamic duo, both seventh graders, found the money along with a deposit slip in a bag on the pavement -- and turned it in. The pair is expected to be recognized during Monday's Franklin County Board of Education meeting. The Tar River Center for History and Culture Foundation has received a grant from the North Carolina Humanities Council, a statewide nonprofit and affiliate of the National Endowment for the Humanities, to undertake an oral history of school desegregation in Franklin County. The project will be carried out by volunteers who are working with the Tar River Center for History and Culture at Louisburg College. 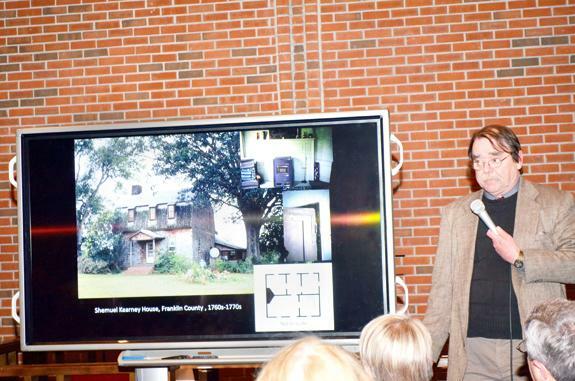 Michael Southern of the state historic preservation office discusses "18th Century Architecture in the Upper Tar River Valley" during a visit to Franklin County last Thursday night. Southern is the senior architectural historian and GIS coordinator with the North Carolina State Historic Preservation Office. His visit was the second annual Joseph E. Elmore Lecture at Louisburg College. LOUISBURG -- A manufacturer that's called Franklin County home since 2010 is eyeing an expansion. The public will get a chance on Feb. 16 to tell commissioners whether or not they want to spend $25,000 in tax money to bolster Palziv's chances at securing a $500,000 grant to help pay for the project. Palziv North America, the U.S.-based subsidiary of Israel-based Palziv, produces a foam material -- made in block and roll form -- that is used as a component in products as diverse as automobiles, to the aerospace industry to carpet padding. Last Thursday was a typical chilly, almost blustery winter evening but the chapel at Louisburg College was filled to capacity with about 85 folks interested in how things were in this region 200-plus years ago. The focal point was 18th Century architecture of the Tar River Valley with a couple of forays north into Virginia for perspective. 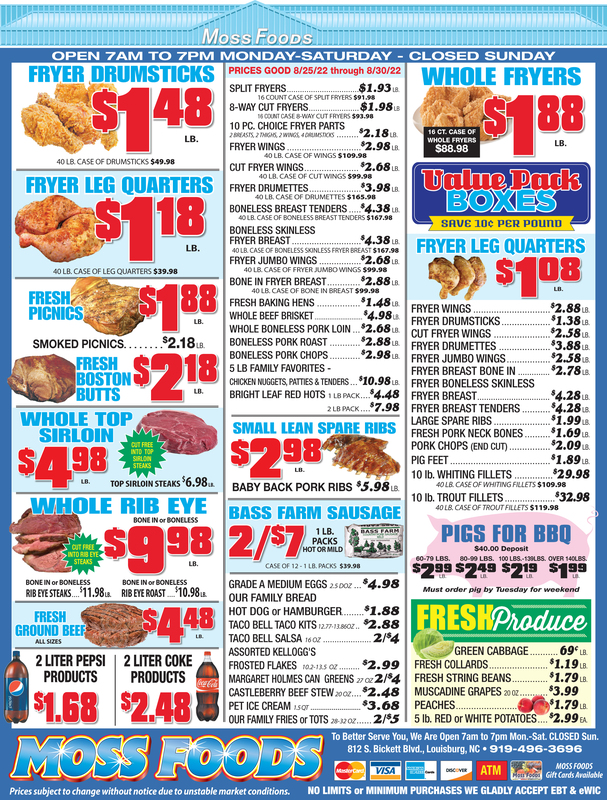 Page one of last week's edition was not only more fun and positive than most newspaper front pages, it also pointed out differences between things happening here in Franklin County and things happening in other regions of our nation. It also caused a bit of head-scratching among those who pulled the page together. For example, the lead story on the page was about Youngsville police officer Det. 1st Sgt. Ronald Adkins dealing with a homeless couple he encountered on an otherwise routine call. I just read a story that, again, laments teacher pay, particularly some General Assembly decisions that appear to give experienced teachers the short end of the stick. In short, legislators gave teachers a pay raise, however, newer teachers are getting a bigger spike in their paychecks while teachers with more experience probably need a magnifying glass and a scientific calculator to calculate the miniscule increases they got. Last Friday Chevron announced it was abandoning its fracking efforts in Poland. 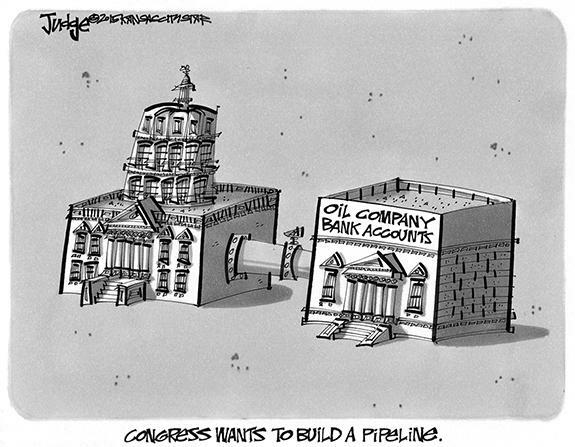 The move followed identical ones by ExxonMobil and the Italian oil and gas giant Eni. Big oil has already pulled out of Lithuania; Ukraine and Romania appears to be next on the list. The bottom line is that the venture no longer appears to be profitable. County's new rules just 'affluent privilege'? Please, someone read the new Franklin County UDO concerning accessory structures and tell me I have misread the ordinance. Scenario: Two Franklin County families (A & B) have residential lots of equivalent size and all other requirements are exactly the same according to the new UDO except for the size of their house. I have just purchased my fourth copy of the new publication, Images of America, Franklin County, by Diane T. Torrent. I enjoyed reading this little book and seeing photos of characters from the past. One of those characters can be found on page 64 labeled "unidentified friend." NORTH PORT, Fla. - Charles H. Lloyd, 87, died in Port Charlotte, Fla., on Saturday, Jan. 31, 2015. 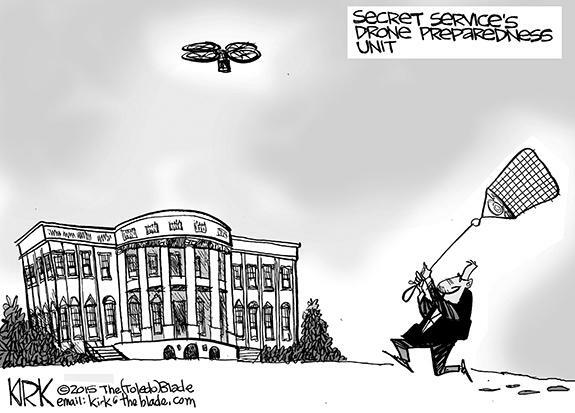 Services were private. WAKE FOREST --Funeral services for Frank Oliver, 95, who died Saturday, Jan. 31, 2015, were held Wednesday, Feb. 4, at First Baptist Church of Franklinton, with the Rev. André Johnson officiating. LOUISBURG - Dr. Janet Leonard Wester, wife, mother, retired English professor, died Tuesday February 3, 2015. She was born January 8, 1933, to W. Henry and Gladys B. Leonard, who preceded her in death. In addition to her parents she was preceded in death by her husband, W. Donald Wester. She loved her family, her home, and her flower gardens. FRANKLINTON --Funeral services for Russell Leroy "Pa Pa" Person, 84, who died Tuesday, Jan. 27, 2015, were held at 1 p.m. Saturday, Jan. 31, at Greater Ransom Way of the Cross Temple, with the Rev. Michael Alston officiating. Burial followed in the church cemetery. CATAWBA - Ruth Elaine Hamlet Mullins, age 89, of Catawba passed away Tuesday, February 3, 2015 at Catawba Regional Hospice in Sherrills Ford. Born April 24, 1925 in Louisburg, NC, she was the daughter of the late Jesse James Hamlet and Mary Tempielane Burnette Hamlet. 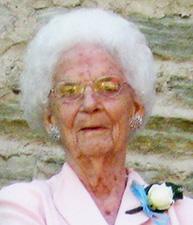 Ruth was member of Pisgah United Methodist Church and retired from Southern Furniture. TANGLED UP WITH YOU. 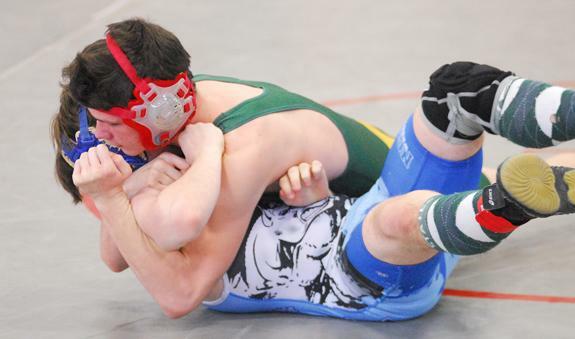 Franklinton's Jacob Coats (right) tries to escape the hold of Bunn's William Hall during last Saturday's match at the Northern Carolina Conference Wrestling Tournament at Southern Vance High School. HENDERSON -- Franklinton carried a Magnificent Seven into the championship round of the Northern Carolina Conference Wrestling Tournament. 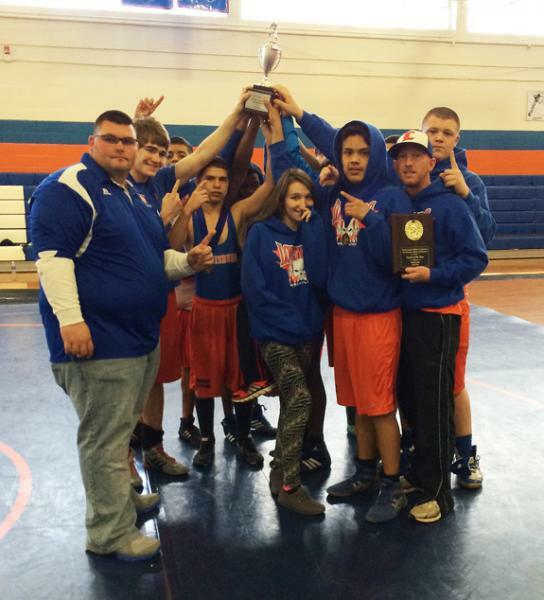 And three Red Rams would earn weight-class victories in the annual event at the Southern Vance High School Gymnaisum. Due to its depth-infused success, Franklinton took second overall in the team standings with 153 points. SPLIT THE DIFFERENCE. Bunn High School's Jonasha Green (with ball) drives between a pair of Durham School of Arts defenders during Tuesday night's Northern Carolina Conference girls basketball meeting at the Bunn Dome. 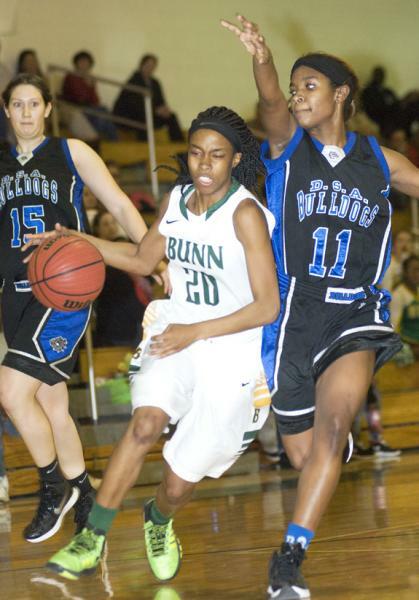 BUNN - With a showdown looming against Warren County, the Bunn Ladycats first needed to take care of business against Durham School of Arts on Tuesday in order to maintain their unblemished record. Bunn had no problem with that quest as the Ladycats pressed their way to an early advantage -- and never looked back. BHS had built a huge lead by the time Coach Matt Keith emptied his bench in the opening seconds of the closing quarter. 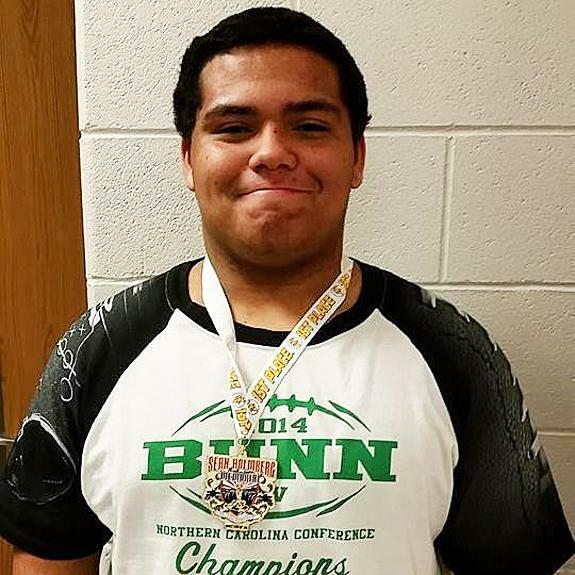 HENDERSON -- From a team perspective, everything played to form last Saturday for the Bunn Wildcats at the Northern Carolina Conference Wrestling Championships. After tying for third place in the NCC's regular season, Bunn claimed third outright at the tournament behind South Granville (first) and Franklinton (second) in the annual event at the Southern Vance High School Gymnasium. HELP, I NEED SOMEBODY. 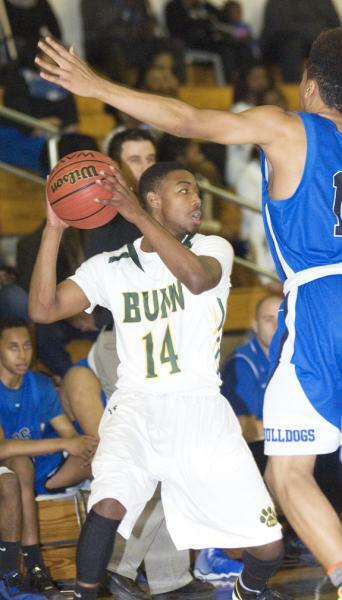 Bunn's Quenten Wright tries to find an open teammate during Tuesday night's home defeat against Durham School of Arts. BUNN -- It's certainly not due to a lack of effort. But Bunn's big-hearted attitude hasn't resulted in many victories lately in the competitive Northern Carolina Conference boys basketball standings. The depleted Wildcats, with only eight players available, did everything they could but came up a little short against Durham School of Arts on Tuesday at home in a key NCC matchup. TREMENDOUS TEAM. Members of the Louisburg High School wrestling squad pose after claiming the Tar-Roanoke Athletic Conference wrestling championship. LOUISBURG -- Excitement has been rising within the Louisburg High School wrestling program during the latter portion of the season -- and it reached its apex over the past several days. Last Saturday morning, Louisburg made quick work of Granville Central and Voyager Academy out of Durham in dual events to claim the Tar-Roanoke Athletic Conference Championship at the LHS Gymnasium. LOUISBURG -- Louisburg High School's surging Lady Warriors had an opportunity to move into a first-place tie in the Tar-Roanoke Athletic Conference last Friday night -- but it wasn't meant to be. Instead, Louisburg saw league leader KIPP Pride pull away in the second half en route to defeating the Lady Warriors by a 40-31 margin at the LHS Gymnasium. LOUISBURG -- When seeking a new football coach, Louisburg College Athletic Director Mike Holloman stressed the need to find a candidate who fully understood what is expected of the program -- both on and off the field. And no candidate boasted the first-hand knowledge of LC defensive coordinator Trevor Highfield, who has been on campus for the past seven years working under former coach John Sala. 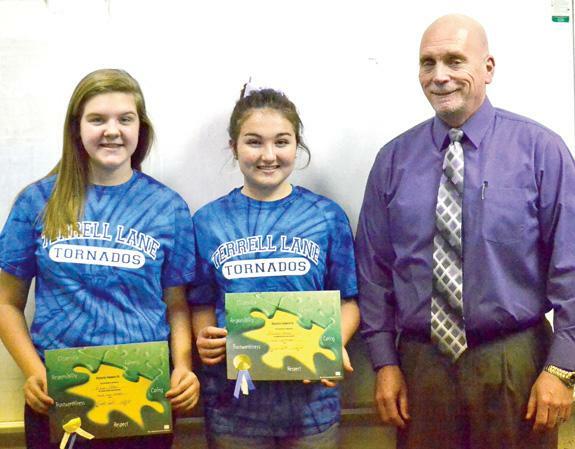 LOUISBURG -- As successful as the Terrell Lane Middle School program has been, one accolade has eluded the Tornadoes -- a Middle Athletic Conference Championship. That changed last Saturday as TLMS claimed the annual MAC Tournament Championship at the Franklinton Middle School Gymnasium. LOUISBURG -- A two-game losing streak is almost unheard of for the Louisburg College men's basketball program. But heading into Wednesday's road matchup at Wake Tech, the Hurricanes were on a two-game slide following a pair of tight setbacks away from home. The stretch began last Wednesday as LC was edged 83-80 by long-time rival Lenoir Community College in Kinston. LOS ANGELES -- Christian Buffaloe, a 15-year-old local Kyokushin knockdown fighter from Warren County, recently gained 2nd Place in the youth division (15 yrs) of the "2015 Kyokushin USWC Championship Tournament" in Los Angeles. There were competitors from Japan, Poland, the Ukraine, Costa Rica, New Zealand, Russia, Canada and the United States. HENDERSON -- The Vance-Granville Community College Vanguards defeated the Tidewater Community College Storm last Saturday, marking the team's first winning streak of the 2014-15 men's basketball campaign, as well as the Vanguards' second consecutive conference win. FRANKLIN COUNTY -- The Miracle League of Franklin County will host its spring baseball registration day on Feb. 28. The event will be held from 9-11 a.m. at the Long Mill Elementary School Gymnasium in Youngsville. Uniforms will be ordered on that day, and there will be plenty of activities for the kids inside the gym. On the same day, the Cypress Creek Civitan Club will host a Snowball Dance for families of special needs children at the Bunn High School Cafeteria. The Franklin County Chargers Youth Wrestling Program fared well during recent action at the 6th Annual Sean Holmburg Tournament in Wake Forest. 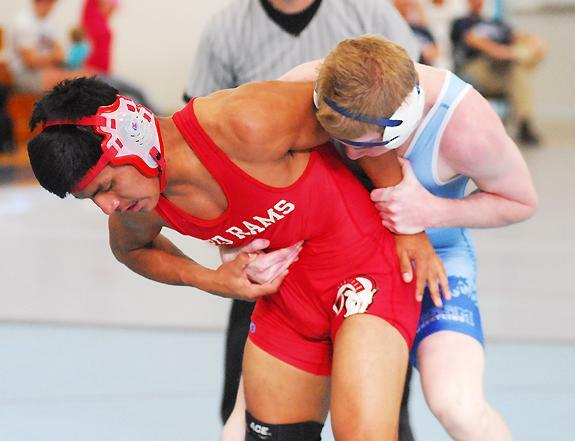 Omar Rosa (above) was a first-place winner in the JV High School 250-pound Heavyweight Class. Franklinton's Alex Galaviz left) tries to gain an advantage during last Saturday's action at the Northern Carolina Conference Wrestling Championships. The annual event was held at Southern Vance High School, which is located in Henderson. 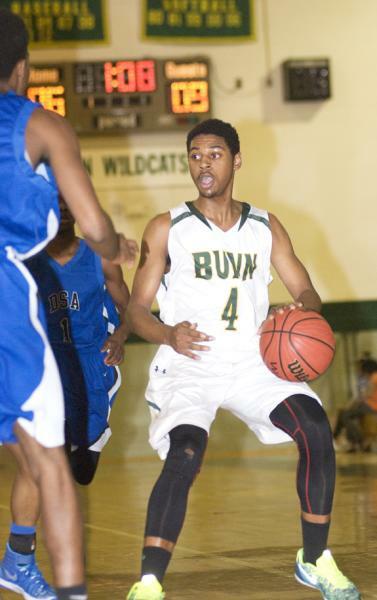 Kendrick Smith has been effective this season for the Bunn High School varsity hoops squad after earning a promotion from the JV team. 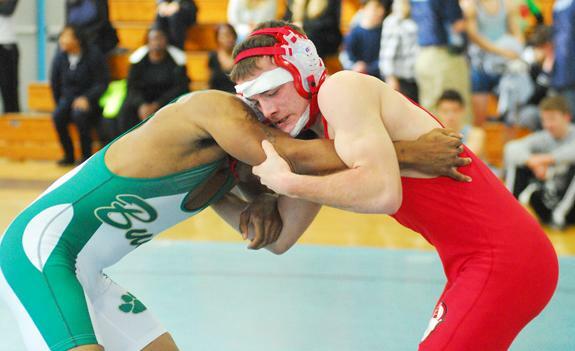 Franklinton's Ruben Santiago (left) escaped this hold and went on to secure a victory in this match as part of the Northern Carolina Conference Wrestling Championships. 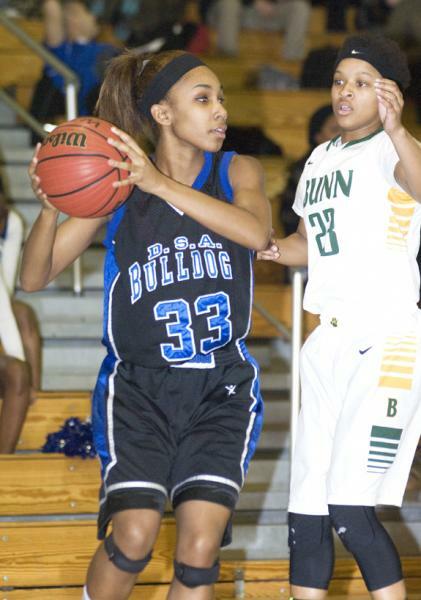 Bunn's Precious Walker provides tight defense during Tuesday's home decision. Donald and Chris Matthews of Louisburg announce the engagement of their daughter, Jessica Lynn Matthews, to Stephen Caleb Piper, son of Steve and Lorna Piper of Franklinton. 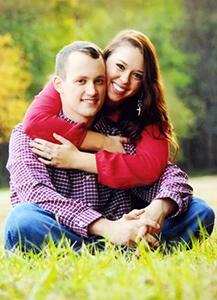 The wedding will take place on May 9, 2015 at 1 p.m. at Freedom Life Church of God. Joan Kemp and Dave Riordan of Halcottsville, NY announce the engagement of their daughter, Kelsey Riordan to Brandon Tyler Hall of Franklinton. 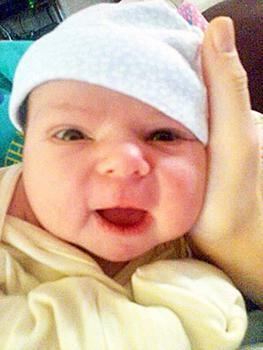 He is the son of Jenny Edwards of Franklinton and the late James Hall of Roseboro. Kelsey and Brandon are both presently teaching English in South Korea. 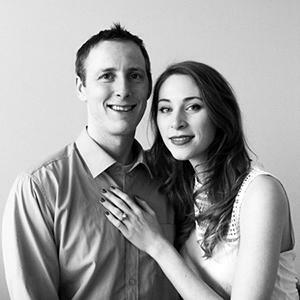 A September wedding is planned in Woodstock, New York. NINE DECADES! On Sunday, Jan. 25, Beulah Edens Phelps celebrated her 90th Birthday at her home in Henderson, surrounded by members of her family. Students and faculty at Bunn High, Franklinton High, and Louisburg High will join others across the nation during February to celebrate national Career and Technical Education (CTE) Month. This year's theme is Recognizing Classroom Innovators! CTE Month provides CTE programs across the country an opportunity to demonstrate how CTE educates students to be college and career ready and prepares them for high-wage, high-demand career fields. The Dollar General Literacy Foundation awarded Concerned About People, Inc. a $3,000 grant to support youth literacy. "We are so grateful for the financial help for our PFIR program because in Eastern North Carolina, literacy is foundational for building our communities, said Dawn Burton, cofounder of Concerned About People, Inc.
PFIR (Proficiency & Fluency in Reading) is a multifaceted academic support program to youngsters (grades 4-8). 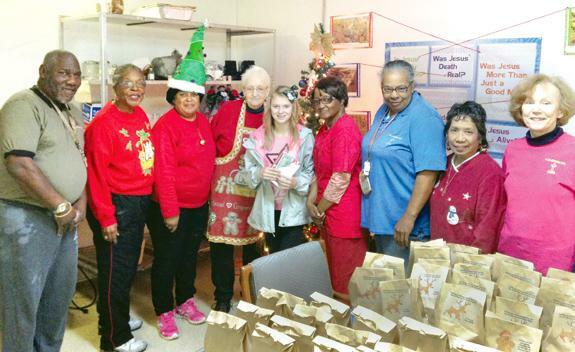 Emily Hymel of Franklinton provided a donation to A Blessing Soup Kitchen. Most recently, she handed over $500 to the group which provides meals for those in need in Franklin County. Hymel, a sixth-grader, donates money from her business, Who La La Soaps and Scrubs, to the Franklin County group. "I hope this is a big amount to you," Hymel wrote in a holiday card to A Blessing. "I have been saving up so I can help ... I will keep on raising money for you," she said. LOUISBURG -- Franklin County Schools and UNC's Morehead Planetarium are hosting STEMville Family Science Night at Edward Best Elementary School as part of a districtwide initiative to spark interest in Science, Technology, Engineering, and Math (STEM). Special guests for the Thursday, Feb. 5 event, will include Sen. Chad Barefoot, Rep. Bobbie Richardson, Novozymes North America President Adam Monroe, and district Superintendent Lisa Martin. LOUISBURG -- A Louisburg woman who has been giving homeowners advice to fight foreclosure proceedings -- without the aid of a legal license -- will have her day in a Franklin County court. The North Carolina State Bar ­-- the agency responsible for regulating the practice of law -- filed a complaint in Wake County Civil Superior Court in September, alleging Mary Ella Hutchinson has been advocating for homeowners facing foreclosure as if she is in attorney. LOUISBURG -- Louisburg police arrested a former hardware store supervisor, charging him with embezzling from his employer. George Stancil Moss, 58, was charged with five counts of larceny by an employee, five counts of embezzlement and one count of accessing computers. BUNN -- School staff said they will review use-of-force protocols after an officer used pepper spray to quell a growing crowd at Bunn High. Bunn Interim Police Chief Joe King said Officer Tim Trader and Principal Robin Faulkner were responding to a report of a fight when they encountered a crowd of about 50 or 60 students who would not disperse and allow the officer and staff to get to the alleged fight. LOUISBURG -- The case against a former arts council treasurer accused of embezzling thousands from the nonprofit organization was moved to superior court. Joe Baisley surrendered to authorities in December after Franklinton investigators took out warrants alleging that Baisley took more than $6,700 from the Franklin County Arts Council and used it for his own purposes. YOUNGSVILLE -- A Wake County man who led Franklin County sheriff's deputies on a two-county, high-speed chase that resulted in a cement truck wreck is slated to appear in court next week -- and next month. 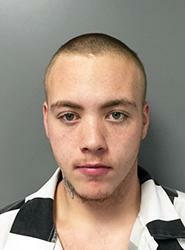 Skylar S. Blackley, 20, faces charges associated with the Jan. 29 incident in Wake and Franklin counties. He was already facing charges from Chatham and Durham counties. LOUISBURG -- Franklin County sheriff's deputies are investigating a stabbing report. A 26-year-old woman reported to authorities on Jan. 27 that Gregory Bolden was walking to his Dupree Drive home when he was approached by two black men. According to the report by K. Fisher, one of the men stabbed Bolden, who was treated at WakeMed for non life-threatening injuries.